There is one thing I always have in my freezer, something that comes is rather handy and possibly something you don’t always keep in yours. Ready Made Puff Pastry, this is key and I’m going to tell you why. Besides pastry being simply delicious and moreish it is great to use to make both starters and desserts. And the next best thing is that it the perfect solution to when you’ve been asked to bring a starter to a dinner party and you’re skint … No meager bag of carrots for you … this is quick and easy and may even add a wow factor. I was invited to a dinner party and needed to bring a starter, the cupboard was bare, the fridge was bare and the wallet was empty. Roll on a bit of innovation and using what I had. The ultimate pantry dish. I remembered I had a roll of puff in the freezer, half a bag of tomatoes and a ripe avo. 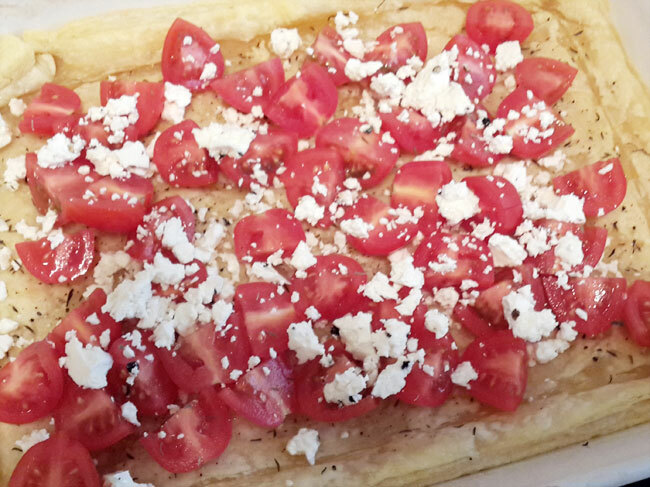 Voila, tomato tart be made. Remember you need to take the puff pasty out a few hours before you make the dish, so in the morning before I left for work was when I did this. Let me tell you this is also a dish you can whack together in almost no time, so with only just over an hour after leaving work to needing to leave for town I got this all done. Preheat the oven to 200 degrees – or whatever it says on the packet … and while that is heating up you can prep you other ingredients. I took out the half bag of baby tomatoes in the fridge and chopped them all in half. 85% of the prep done! The oven was heated and all that was left to do was roll it out on a pre-greased (i.e. a bit of spray and cook to the dish), all that needed to happen was score the edges – making a border and pricking the base a few times. Season the base with salt, pepper and a bit of thyme (or whatever tickles your fancy). Let the pastry bake for about 20 minutes or so, don’t freak out it will rise but this will settle down once you add your toppings. Once the pastry is well cooked take it out of the oven and add the chopped tomatoes to the base (seeds up otherwise the base gets really soggy – although it will still be slightly soggy sometimes). I season the tomatoes again and then crumbled some feta for good measure. I love feta with black pepper, so don’t overkill the seasoning with pepper. Bake for another 20 minutes or so. Until the tomatoes have the cooked look and you can smell the yummy delish when you open the oven. While this is cooking slice you avocado pear into thin slices. 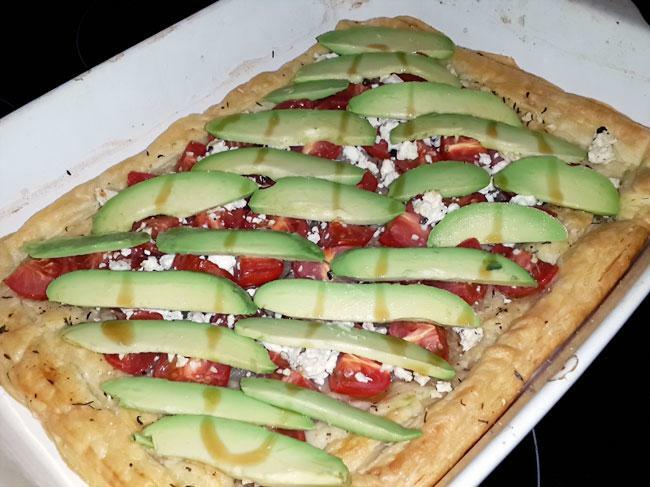 Once the tart is cooked to your liking, pull out of the oven and layer the avo on top. For cook measure I drizzled another store cupboard favourite – a balsamic reduction chilli sauce thing. Ultra tasty and just adding the tiniest bit of zing to the dish. Wham, bam, thank you mamn. A quick dinner party, picnic or anytime treat. 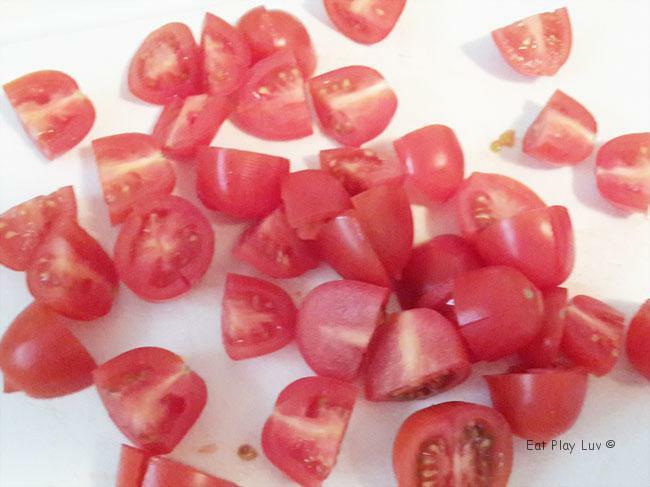 Other variations depending on time is just use the tomato and rip up fresh basil leaves before serving. Or caramalise onions and use those alternatively add a bit of balsamic to the onions. This recipe can be made into one big tart, individual tarts and can be served either hot or cold. Whatever you do remember to add your own flair to the tart. Let me know how it turns out. This entry was posted in Eat and tagged bake, dinner with friends, pastry, tart, yummy delish. Waaaaahahaha! Pete the Meat Puppet! Pow Pow!